It’s been a busy week, and I wasn’t sure if I’d get a chance to put up a snapshot today, but when I sat down at my computer after dinner while Charlie had Stella in the bath, I saw that my sister had just tagged me in a picture on Facebook. Wow – flashback city. One year ago today, Stella was baptized in my home church. Charlie’s brother and our SIL are on the left (that little boy in her belly is almost eight months old now), and my sister and our BIL are on the right (they’re the ones who just got married in this same church a month ago). They are all who we chose to be Stella’s Godparents, and we couldn’t have asked for better people to be involved in Stella’s spiritual upbringing. We have other exciting news around our household this week as well, so I’ll try to get a quick post up about that tomorrow! This is part of a weekly feature called The Monday Snapshot over at PAIL. Click here to see everyone else’s contributions and to learn a little more about this week’s featured blogger, Elizabeth! so cute! You and your sis have the exact same smile! Beautiful photo! 🙂 Amazing to see how much little Stella has grown and changed since then. What the what? What kind of cliffhanger is THAT? 🙂 Beautiful picture. Isn’t it crazy how TINY those babes once were?? Lovely picture. 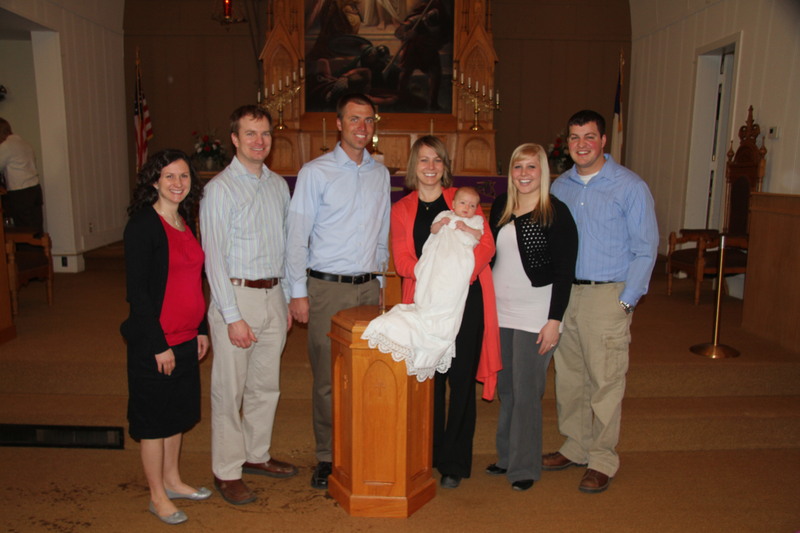 Wow that is a beautiful baptismal dress Stella is wearing. St Patricks day will be twelve months since we had James christened, how time flys! Yeah. I agree. I’m totally UNokay with cliffhangers. 🙂 Love the pic tho!!! I remember that post like it was yesterday. 🙂 so beautiful!